On November 5, 1781 the United States in Congress Assembled (USCA) elected John Hanson President. He was the third to serve as the USCA President under the Constitution of 1777, the Articles of Confederation. John Hanson of Maryland was the third President United States in Congress Assembled President (USCA President), serving from November 5, 1781—November 4, 1782 at Pennsylvania State House (Independence Hall) in Philadelphia. He was born in Charles County, Maryland. There is debate about both his birth date (some say 1715, others 1721) and his ancestry, with some claiming descent from Swedish Royalty and others that he was a Moor (neither is correct). Hanson became sheriff of Charles County in 1750. Elected to the Maryland House of Delegates, he served nearly every year from 1757 until 1781. After leaving the House of Delegates in 1769, Hanson moved to Frederick County and became its treasurer in 1775 and a delegate to the Maryland Convention. He chaired the 1776 Frederick County meeting that recommended to Maryland’s leaders that they authorize their delegates serving in the Second Continental Congress to declare independence from Great Britain. In 1777, Hanson returned to Maryland’s new House of Delegates in Annapolis, who sent him to Congress as a delegate in 1780. At that time, Maryland, which did not have any western land claims, was waiting for the other states to abandon theirs in the West before ratifying the Articles of Confederation. Once that happened, Maryland agreed to ratify the Articles and on March 1, 1781, John Hanson and Daniel Carroll signed them. On November 5, 1781 John Hanson became the first USCA President elected to the full one-year term as mandated under the Articles of Confederation. During Hanson’s presidency, George Washington presented General Cornwallis’s sword to Congress, a Presidential Day of Fasting Proclamation was issued, Congress shifted presidential communication duties to the USCA Secretary, legislation was passed to create a United States Mint, there was a reorganization of the Department of Foreign Affairs, Congress adopted the current United States Great Seal, a Congressional recommendation of Robert Aitken’s edition of the Bible to the inhabitants of the United States, and the acknowledgement of United States by both Great Britain and the Dutch governments. John Hanson died at Oxon Hill, Maryland on November 22, 1783. His crypt and its remains were razed by developers building the National Harbor. Today, his coffin’s location is unknown. 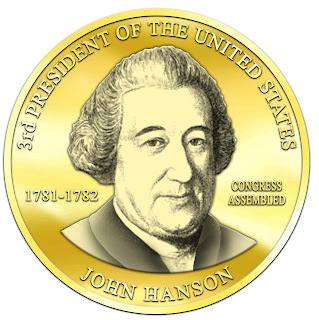 John Hanson of Maryland was elected the third President of the United States, in Congress Assembled on November 5, 1781 serving until November 3, 1782. He was not the first President of the United States nor the United States in Congress Assembled. 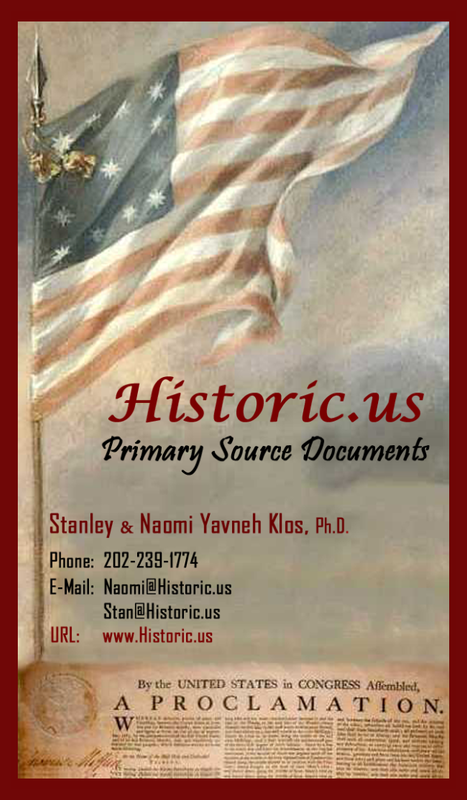 John Hanson was born in Mulberry Grove, near Port Tobacco in Charles County, Maryland on April 3, 1721 before the British Empire adopted the Gregorian calendar which now adjusts the date to April 14, 1721 (See Dr. Edward Papenfuse's Hanson Biography). Hanson's parents were Samuel (1685-1740) and Elizabeth Story Hanson (ca. 1688-1764). Samuel Hanson was a farmer who owned more than 1,000 acres and held a variety of political offices, including serving two terms in the Maryland General Assembly. There is much debate about John Hanson's ancestry with camps claiming he was descended from Swedish Royalty while the other group claiming he was a blackMoor. Neither of the assertions have merit. John Hanson received a common colonial education and pursued, along with his family, agriculture. Hanson was married to Jane Contee in 1743, a French Huguenot from Rochelle Maryland. Her family immigrated, first to England, during the reign of Louis XIV before settling in the Maryland colony. Together, they had eight children with three sons, Alexander Contee Hanson, Peter Contee Hanson, and Samuel Contee Hanson who would serve as officers in the Continental Army. The first record of a political John Hanson occurred in 1750 as sheriff of Charles County serving until 1753. In 1757 he was elected for his first one year term in the Maryland Assembly. Hanson would remain a member of the assembly for nine terms. His political involvement in the revolutionary movement can be traced back to the 1765 Stamp Act. It was Hanson who chaired the committee that drafted the instructions for Maryland's delegates to the Stamp Act Congress. Hanson was also a leader in the Association of Maryland Freeman that was formed in protest of the Townshend Acts. Hanson was a signer of the 1769 nonimportation resolution that boycotted British goods until the Townshend Acts were repealed on April 12, 1770. In 1769, John Hanson resigned his seat from the Maryland Assembly at the beginning of the second session because he received the appointment of Deputy Surveyor of Frederick County which, at the time included all of Western Maryland. The post required the sale of his Charles County farm and the relocation of his family to Frederick Town on 108 W. Patrick Street. Founded in 1745, Frederick was on the frontier of the Maryland Wilderness and flourished in the colony's expansion becoming a major communication route for western settlers. As Deputy Surveyor, Hanson was responsible for surveying all colonial land transfers in Western Maryland before a land patent was issued. This proved to be a very active post for the 48 year old who was constantly surveying parcels in Maryland’s wilderness where settlement was just beginning to take place. In 1772, a Dr. Philip Thomas built a house at 110 W. Patrick St. next door to the Hanson family. A year later, Thomas married Hanson's oldest daughter, Jane. This began a lifelong friendship between the two men that included voluminous correspondence and business partnerships. Hanson, an avid farmer, also held numerous positions in Frederick County, including the Chairman of the Committee of Observation and Frederick County Treasurer. ASSOCIATION of the FREEMEN of MARYLAND July 26, 1775. The long premeditated, and now avowed design of the British Government, to raise a revenue from the property of the colonists without their consent, on the gift, grant and disposition of the Commons of Great Britain; the arbitrary and vindictive statutes passed under color of punishing a riot, to subdue by Military force, and by famine, the Massachusetts Bay; the unlimited power assumed by parliament to alter the charter of that province, and the constitution of all the colonies, thereby destroying the essential securities of the lives, liberties and properties of the colonists; the commencement of hostilities by the ministerial forces, and the cruel prosecution of the War against the people of the Massachusetts Bay, followed by General Gage's proclamation, declaring almost the whole of the Inhabitants of the united colonies, by name or description, rebels and traitors are sufficient causes to arm a free people in defence of their liberty, and to justify resistance, no longer dictated by prudence merely, but by necessity, and leave no alternative but base submission or manly opposition to uncontroulable tyranny. The Congress chose the latter, and for the express purpose of securing and defending the united colonies, and preserving them in safety, against all attempts to carry the above-mentioned acts into execution by force of arms. Resolved, that the said colonies be immediately put into a state of defense, and now supports, at the joint expence, an army to restrain the further violence, and repel the future attacks of a disappointed and exasperated enemy. We therefore inhabitants of the Province of Maryland, firmly persuaded that it is necessary and justifiable to repel force by force, do approve of the opposition by Arms to the British troops, employed to enforce obedience to the late acts and statutes of the British parliament, for raising a revenue in America, and altering and changing the charter and constitution of the Massachusetts Bay, and for destroying the essential securities for the lives, liberties and properties of the subjects in the united colonies. And we do unite and associate, as one band, and firmly and solemnly engage and pledge ourselves to each other, and to America, that we will to the utmost of our power, promote and support the present opposition, carrying on, as well by Arms, as by the continental association, restraining our commerce. And as in these times of public danger, and until a reconciliation with Great Britain, on constitutional principles is effected (an event we most ardently wish may soon take place) the energy of government may be greatly impaired, so that even zeal unrestrained, may be productive of anarchy and confusion; We do in like manner unite, associate, and solemly engage in maintenance of good order, and the public peace, to support the civil power in the due execution of the laws, so far as may be consistent with the present plan of opposition; and to defend with our utmost power all persons from every species of outrage to themselves or their property, and to prevent any punishment, from being inflicted on any offenders, other than such, as shall be adjudged by the civil magistrate, continental congress, our convention, council of safety, or committees of observation. In 1775, Fredrick County Treasurer Hanson was elected a member to the Maryland Provincial Convention. 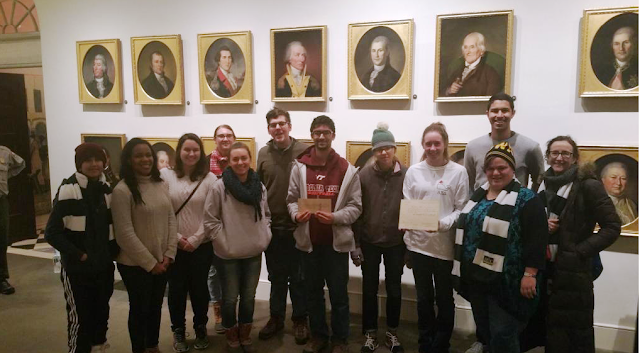 A year earlier the convention had established the Maryland Committee of Correspondence which was instrumental in calling and forming the First Continental Congress. X. 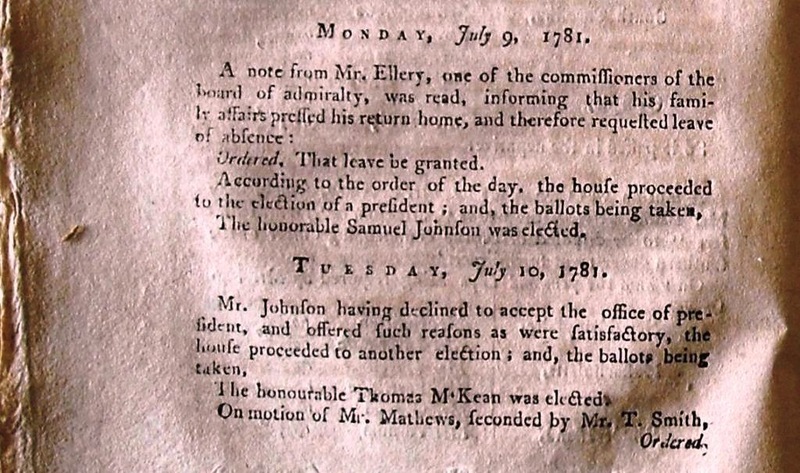 Resolved, That Matthew Tilghman, Thomas Johnson, jun., Robert Goldsborough, WilliamPaca, and Samuel Chase, Esqrs., or any two or more of them, be deputies for this province, to attend a general congress of deputies from the colonies, at such time and place as may be agreed on to effect one general plan of conduct, operating on the commercial connection of the colonies with the mother country, for the relief of Boston and preservation of American liberty; and that the deputies for this province immediately correspond with Virginia and Pennsylvania, and through them with the other colonies, to obtain a meeting of the general congress, and to communicate, as the opinion of this committee, that the twentieth day of September next will be the most convenient time, and the city of Philadelphia the most convenient place, for a meeting, which time and place, to prevent delay, they are directed to propose. At Annapolis Hanson fearlessly joined in the overthrow of the Maryland colonial régime and voted to place the government into the control of the provincial convention. Hanson was commissioned by the Maryland Provincial Convention to establish a gun-lock factory at Frederick in 1775. In this position he organized and oversaw Frederick’s manufacture of arms, gun locks, gunpowder, ammunition and other army munitions equipment for the Continental Army. In November of 1778, Hanson was elected to the Maryland State Assembly and took a strong stance against Maryland ratifying the Articles of Confederation. As the former surveyor of Maryland’s western lands, his fellow delegates took notice of his insistence that all Great Britain ceded western lands must be released to the newly proposed United States in Congress Assembled (USCA) federal government before Maryland would agree to the Articles of Confederation. On December 21, 1779, in recognition for his work in the revolutionary cause, John Hanson was elected a Delegate to the U.S. Continental Congress. I have been confined to my Room a fortnight, and was so unwell when the last post set out, that I was not able to Write, I am now on the recovery, and hope to be able to attend Congress in a day or two. … Congress received a letter by Express from General Gates dated Hillsborough August 20th giving an Account (tho' a very Confused one) of His unfortunate Defeat near Camden, on the 16th. He says he marched about 10 o’clock in the night of the 15th, to possess himself of an advantageous piece of Ground about Seven miles from Camden. About 2 o’clock in the Morning His light Horse was attacked by those of the Enemies but were repulsed. Upon this he halted the Army and nothing more hap­pened till about break of Day, When he was attacked by the Whole fury of the Enemy. His Army was drawn up with the Virginia Militia on the left, the North Carolina militia in the Center and General Gist on the right. General Smallwood was in the rear, as a Corps De' reserve. The Militia to a man fled the first fire, and left our brave regu­lars to Sustain the Whole force of the Enemy. General Gates went off with the Militia, endeavoring to rally them, but to no purpose, and while he was thus engaged. He Says the firing between the two Armies Ceased, by which he Concluded all was over, and therefore made the best of his Way to Hillsborough Where he arrived the 19th performing a Journey of 196 miles in less than four days. He Knows nothing of what became of the Regulars, but says he should immediately Send off a flag to gain the necessary information. Saturday last an Express Arrived from Governor Nash dated the 26th Advising that Generals Smallwood, And Gist, had bravely Cut their Way thro' the Enemy With about 400 men-that the Militia were again Collecting, that they had got together between two and three thousand, regulars included. This day another letter has been received from General Gates with a list of the Officers that are Safe to Wit Generals Smallwood and Gist, Colonels Williams, Gunby and about 700 privates. The list also contains the Names of those officers that are missing, but I have not Seen it, neither Can I procure a Copy to Send you by this Opportunity. Baron de Calmb is Dead of His wounds. Our loss on the Whole about 500 and that of the Enemy as many. We have also lost all our Baggage Wagons and Eight pieces of Cannon. Our main Army is in the greatest distress for want of provisions Were Without meat from the 21st to the 26th and Some have not had one day With another not one third allowance. The general moved into the neighborhood of Fort Lee with a View of Stripping that part of the Country of the remainder of its Cattle Which after a most rigorous exertion afforded only two or three days’ supply and this Consisting of milch Cows and Calves of one or two years old. This manner of procuring is very distressing and attended With ruin to the morals and discipline of the Army, during the five days Which small parties were Sent out to procure provisions for themselves, the most enor­mous excesses were Committed. It has been no inconsiderable Support to our Cause to have had it in our power to Contrast the Conduct of our Army With that of the Enemy, and to convince the Inhabitants, that While their rights were Wantonly Violated by the British Troops, by ours they were respected. This distinction must now unhappily Cease, and we must assume the Odious Character of the plunderers instead of the protectors of the people, the direct Consequence of Which must be to Alienate their minds from the Army, and insensibly from the Cause-in short, if this method of procuring provisions for the Army is not very speedily prevented, by an exer­tion of the States in Sending forward Supplies the Army must disband, and we are undone. It is reported and Credited by many that a french fleet of 18 Ships of the line and some frigates are on the Coast. They were Seen it is Said Some days ago to the Northward of our Capes. Our new raised Battalion is ordered by the general to the Southward. Your favour by the last post, I am much obliged to you for. I am very Sorry to be informed, that the principal object of the meeting of the General Assembly has not yet been taken into Consideration, I mean that of procuring Men and Supplies for the Army; yet from the good Opinion I entertain of the present leading Members of each House, I flatter myself everything of importance Will be Attended to, before you rise. The Trustees having protested our Bills Will be favorable to the Views of those who are for Confiscation. Immediately on the receipt of your letter, Which was late this afternoon, I went to Mr. Morris's to make the enquiry you desired me, but Mr. Morris was too ill to be Spoke With, Which prevents my giving you the information you Want, at present. Advices from Spain and France of the 25th September, and 15th October say, that General Clinton had requested to be recalled, unless a reinforcement of 10,000 men, was immediately Sent him-that a vessel had Sailed from England, With dispatches Containing assurances, that the King entirely Approved of His Conduct-that he Should be Aided With all the Supplies in their power, And that orders were given for raising Nine regiments of foot, And one of Horse, to be Sent out Early in the spring. That nine Sail of the line and a number of Transports, With 4000 Troops, would Sail from Brest in a day or two, destined to reinforce Admiral Ternay. The King of Spain is much pleased With the Resolution of Congress, permitting the Exportation of flour for the use of His fleets and Armies, in the West Indies, and desired that his thanks might be Conveyed to Congress, for Such a proof of their friendly disposition, And the Minister gave the strongest Assurances, that his majesty Would never Consent to a pacification With England which did not include the Interest of America. Measures for Sending Commissioners from G B to treat with Congress, is under Consideration of the Privy Council, And it is thought would be adopted. Mr. Cumbaland Still remains at Madrid-the Abbe Hussey, his Coadjutor has received A Passport to go to Lisbon, and from thence to London, and return With the Ultimatum of that Court. (Is it not something mysterious that a Secretary to Lord George Germain one of the King of G B Ministers Should be permitted to reside at the Court of His most Christian Majesty in time of war?). England hath not yet completed her last years Loan. All the powers will find it difficult to procure money to carry on the War. France hath already begun to Tax, and it is probable must Continue to do so. The great Neutral powers of Europe Seem to regard the present War, as an Event favorable to the Augmentation of their Commerce, and Will probably do so until one or other of the Contending parties, appear to have a decided Superiority. Portugal it is Said Seems better disposed to the Allies than heretofore. The Combined fleet at Cadiz, Consists of 45 Sail of the line besides frigates &c-the Count D’ Estaing Commands the French part of the Fleet, and the Whole was ready to put to Sea. Mr. Laurence was taken on his passage to Holland and Conveyed to London, and is committed to the Tower on a Charge of High Treason. The Main Army is gone into Winter Quarters. My Compliments to Mr. Carroll and the Ladies … It would give me great pleasure to see you here. Hanson's appeal, among his fellow Continental Congress Delegates, was tenuous at best. The Articles of Confederation that were enacted in 1777 were ratified on July 9, 1778, by ten states; by New Jersey on the 26th of November 1778; and by Delaware, on the 23rd of February 1779. Maryland remained the lone holdout on the Articles and John Hanson, the former surveyor of Maryland’s western lands, was thought by many rival state delegations to be the major impediment to the state’s ratification. 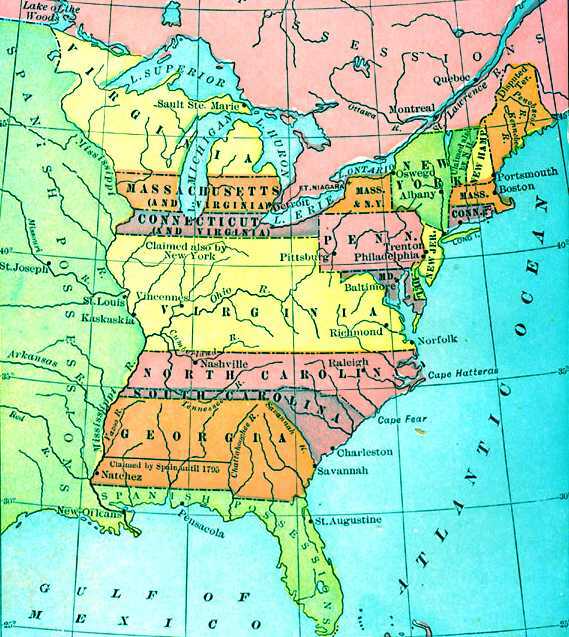 For two years the Continental Congress had been the stage for incessant wrangling between Maryland, Connecticut, New York, Virginia, the Carolinas, and Georgia over the state land claims in the western territories. Maryland was engaged in state line border disputes with its neighbors but the real issue standing in the way of ratification was the release of all state claims of western territory to the proposed Articles of Confederation government, the United States in Congress Assembled (USCA). John Hanson’s Delegate correspondence dropped off dramatically after the ratification of the Articles of Confederation. He was, however, plagued with the ills of the hyper-inflation of the U.S. dollar. In 1780, President Samuel Huntington insisted that the only solution to the United States financial ills of debt amounting to 200 million dollars in 1780 was “fixing a standard for the currency.” By March 1780, Congress was faced with the dollar devaluing to new lows that in some sections of the nation were trading at $50 U.S. dollars for one Spanish silver dollar. 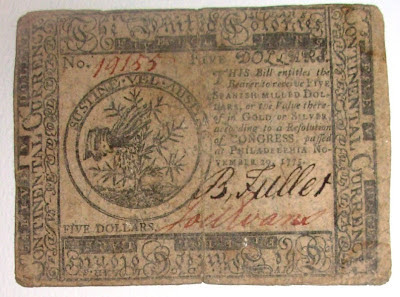 On March 18, 1780, with the enactment of a resolution, the U.S. Continental Congress reneged on its currency face guarantee of exchanging 1 U.S. dollar for 1 Spanish Milled Dollar hyper-inflating repayment to 40 U.S. Dollars to 1 Spanish Milled Dollar. The U.S. Congress, by the stroke of a pen effectively reduced the national debt they owed in Spanish Milled Dollars from $200,000,000 to $5,000,000 with the enactment of the March 18, 1780 resolution. The President’s Connecticut delegation, that included Roger Sherman and Oliver Ellsworth, voted unanimously for the resolution believing that the new currency policy would result in the stabilization of the national economy. The following table represents the official marks of the U.S. Dollar depreciation from May 1775 to March 18, 1780. Mr. Carroll and I wrote to your Excellency and the Honorable Council by last post, requesting a Supply of one thousand Dollars each of the new Emission, but at the present Exchange, I find that Sum Will be insufficient to answer my Immediate purposes. The Exchange between gold and silver, and the Emissions of the 18th March, Issued by the State of Maryland, is as 40 to 140, so that one silver Dollar is equal to three and a half. I must therefore request that my Sum may be increased to fifteen hundred Dollars for Which I Will be Accountable at the Exchange that may be Settled by the state. Janey and Tammy’s State of health and the distressed and perplexed Situation Mrs. Hanson is in left alone a prey to Melancholy and despair destroys my peace of mind and renders me truly Miserable. Should have left this place last week but since the ratification of the Confederation nine States are required to make a Congress. Four are unrepresented And my withdrawing would leave a number insufficient to transact Business which at this Critical Conjuncture would perhaps be thought unpardonable however I hope to get Away by Thursday next. Some absent Members are sent for and one from Jersey is expected in today or tomorrow when that State will be represented. I hope you put yourself to no inconvenience in sending the money you enclosed. I could have done without it though I have not received one farthing from the state since I have been here. What you have directed shall be purchased. His daughter Jane's health continued to decline and he returned to Maryland in mid-April to be near his daughter, Philip’s wife, through her final illness. Jane died later that summer. John Hanson did not return to the USCA until September 24th. The business partnership and friendship that existed between his son-in-law and Hanson remained intact by evidence of their numerous letters during the 1781-1781 USCA session. Prior to John Hanson's return to congress, on May 4th, 1781, after three months of committee work and a final debate, the United States in Congress Assembled approved the thirty-five rules for conducting the nation’s business under the Articles of Confederation. The new rules stripped the Presidential office of its important political power to choose when and what matter came before the United States in Congress Assembled. It is no wonder that President Samuel Huntington resigned and on July 8th, 1781, Delegate Thomas McKean would write to Samuel Adams, about the upcoming presidential election as "this honor is going a begging; there is only one Gentleman, and he from the Southward, who seems willing to accept, but I question whether he will be elected." 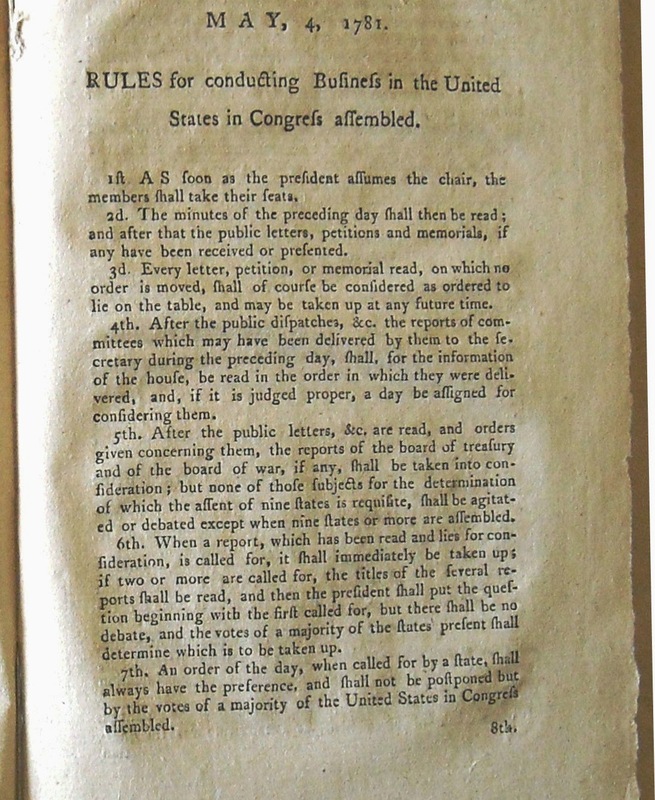 Rules for Conduction Business, in the United States in Congress Assembled dated May 4th, 1781, in this entry of The Journals of Congress and the United States in Congress Assembled, For the Year 1781, Published By Order of Congress, Volume VII New York: Printed by John Patterson. This entry reports the that new governing entity, The United States in Congress Assembled, now governs the United States of America -- Image courtesy of the Historic.us Collection. 1. As soon as seven states are met the President may assume the chair, upon which the members shall take their seats. 2. The minutes of the preceding day shall then be read, and after that the public letters, petitions and memorials, if any have been received or presented. 3. Every letter, petition or memorial read, on which no order is moved, shall of course be considered as ordered to lie on the table, and may be taken up at any future time. 4. After the public dispatches, &c., the reports of committees which may have been delivered by them to the secretary during that morning or the preceding day shall, for the information of the house, be read in the order in which they were delivered, and, if it is judged proper, a day be assigned for considering them. 5. After the public letters, &c., are read, and orders given concerning them, the reports of the Board of Treasury and of the Board of War, if any, shall be taken into consid­eration; but none of those subjects for the determination of which the assent of nine states is requisite shall be agitated or debated, except when nine states or more are assembled. 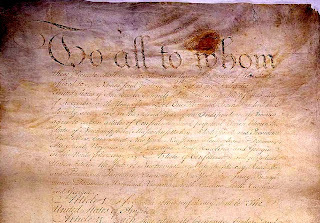 When a doubt is raised whether any motion or question is of the number of those for the determination of which in the affirmative the articles of confederation require the assent of nine states, the votes and assent of nine states shall always be necessary to solve that doubt, and to determine upon such motions or questions. 6. When a report, which has been read and lies for consideration, is called for it shall immediately be taken up. If two or more are called for, the titles of the several reports shall be read, and then the President shall put the question beginning with the first called for, but there shall be no debate, and the votes of a majority of the states pres­ent shall determine which is to be taken up. 7. An order of the day, when called for by a State shall always have the preference and shall not be postponed but by the votes of a majority of the United States in Congress assembled. 8. When a report is brought forward for consideration it shall first be read over and then debated by paragraphs and each paragraph shall be subject to amendments. If it relates only to one subject being in the nature of an ordinance it shall be subject to such additions as may be judged proper to render it complete and then it shall be read over as it stands amended and a question taken upon the whole: But if it com­prehends different subjects, independent one of another, in the form of distinct acts or resolutions a question shall be taken on each and finally a question on the whole. 9. No motion shall be received unless it be made or Negatived, seconded by a state. When any ordinance is introduced by report or otherwise, it shall be read a first time for the information of the house without debate. The President shall then put the following question "Shall this ordinance be read a second time." If it passes in the affirmative then a time shall be appointed for that purpose when it shall be read and debated by paragraphs and when gone through, the question shall be "Shall this ordinance be read a third time"; if agreed to, and a time appointed, it shall be accordingly read by paragraphs, and if necessary debated, and when gone through the question shall be "Shall this ordinance pass", if the vote is in the affirmative, a fair copy shall then be made out by the Secretary, either on parchment or paper and signed by the President and attested by the Secretary in Congress and recorded in the Secretary's office. 10. When a motion is made and seconded it shall be repeated by the President or If he or any other member desire being in writing it shall be delivered to the President in writing and read aloud at the table before it, shall be debated. 11. Every motion shall be reduced to writing and read at the table before it is debated if the President or any member require it. 12. After a motion is repeated by the President or read at the table it shall then be in the possession of the house, but may at any time before decision, be withdrawn, with the consent of a majority of the states present. 13. No member shall speak more than twice in any one debate on the same day, with-out leave of the house, nor shall any member speak twice in a debate until every member, who chooses, shall have spoken once on the same. 14. Before an original motion shall be brought before the house, it shall be entered in a book to be kept for the purpose and to lie on the table for the inspection of the members, and the time shall be mentioned underneath when the motion is to be made, that the members may some prepared and nothing he brought on hastily or by surprise. 15. When a question is before the house and under debate, no motion shall be received unless for amending it, for the previous question, or to postpone the consideration of the main question or to commit it. 16. No new motion or proposition shall be admitted under color of amendment as a substitute for the question or proposition under debate until it is postponed or disagreed to. 17. When a motion is made to amend by striking out certain words, whether for the purpose of inserting other words or not, the first question shall be "Shall the words moved to be struck out stand?" 18. The previous question (which is always to be understood in this sense that the main question be not now put) shall only be admitted when in the judgment of two states at least, the subject moved is in its nature or from the circumstances of time or place improper to be debated or decided, and shall therefore preclude all amendments and farther debates on the subject, until it is decided. 19. A motion for commitment shall also have preference and preclude all amendments and debates on the subject until it shall be decided. 20. On motions for the previous question for committing or for postponing no member shall speak more than once without leave of the house. 21. When any subject shall be deemed so important as to require mature discussionor deliberation before it be submitted to the decision of the United States in Congress assembled, it shall be referred to the consideration of a grand committee consisting of one member present from each State, and in such case each State shall nominate its member. But the United States in Congress assembled shall in no case whatever be resolved into a committee of the whole. Every member may attend the debates of a grand committee and for that purpose the time and place of its meeting shall be fixed by the United States in Congress assembled. 22. The states shall ballot for small committees, but if upon counting the ballots, the number required shall not be elected by a majority of the United States in Congress assembled, the President shall name the members who have been balloted for, and the house shall by a vote or votes determine the committee. 23. If a question under debate contains several points any member may have it divided. 24. When a question is about to be put, it shall be in the power of any one of the states to postpone the determination thereof until the next day, and in such case, unless it shall be further postponed by order of the house the question shall, the next day immediately after reading the public dispatches, &c. and before the house go upon other business, be put without any debate, provided there be a sufficient number of states present to determine it; if that should not be the case, it shall be put without debate as soon as a sufficient number shall have assembled. 25. If any member choose to have the yeas and nays taken upon any question, he shall move for the same previous to the President's putting the question and in such case every member present shall openly and without debate declare by ay or no his assent or dissent to the question. 26. 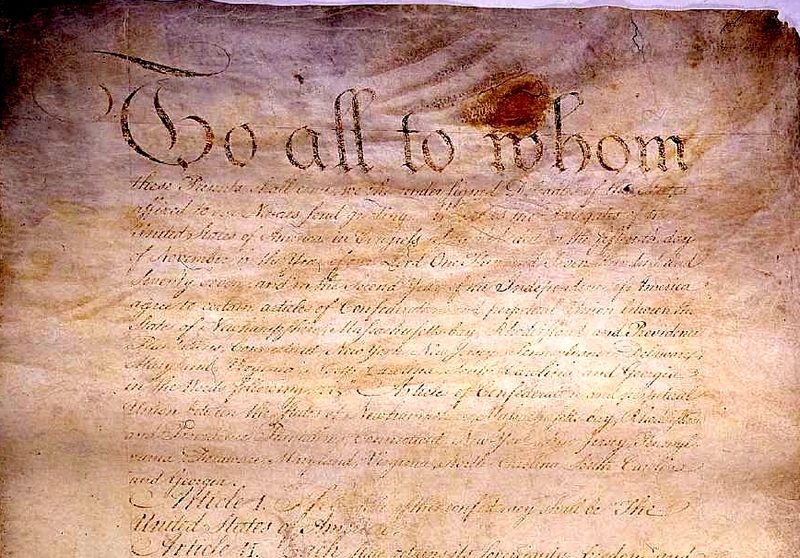 When an ordinance act or resolution is introduced with a preamble, the ordinance, act or resolution shall be first debated, and after it is passed, the preamble if judged necessary shall be adapted thereto: But if the preamble states some matter or thing as fact to which the house do not agree by general consent, and the ordinance, act or resolution is grounded thereon, the preamble shall be withdrawn or the fact resolved on as it appears to the house previous to any debate on the ordinance act or resolution; and if the fact shall not be established to the satisfaction of a majority of the United States in Congress assembled, the ordinance, act or resolution shall fall of course. 27. Every member when he chooses to speak shall rise and address the President. When two members chance to rise at the same time, the President shall name the person who is to speak first. Every member both in debate, and while the states are assembled shall conduct himself with the utmost decency and decorum. If any member shall transgress, the President shall call to order. In case the disorder be continued or repeated the President may name the person transgressing. Any member may call to order. 28. When a member is called to order, he shall immediately sit down. If he has been named as a transgressor, his conduct shall be inquired into and he shall be liable to a censure. 29. When a question of order is moved, the President if he is in doubt may call for the judgment of the house, otherwise he shall in the first instance give a decision, and an appeal shall lie to the house, but there shall be no debate on questions of order,except that a member called to order for irregular or unbecoming conduct or for improper expressions may be allowed to explain. 30. A motion to adjourn may be made at any time and shall always be in order, and the question thereon shall always be put without any debate. 31. No member shall leave Congress without permission of Congress or of his constituents. 32. No member shall read any printed paper in the house during the sitting thereof. 33. On every Monday after reading and taking order on the public dispatches a committee of three shall be appointed, who shall every morning during the week report to Congress the orders necessary to be made on such dispatches as may be received during the adjournment or sitting of Congress, upon which no orders shall have been made. The members of such Committee not to be eligible a second time until all the other members have served. 34. The habit of a member of Congress in future shall be a plain purple gown with open-sleeves, plaited at the bend of the arm. And that no member be allowed to sit in Congress without such habit. 35. The members of each state shall sit together in Congress, for the more ready conference with each other on any question above be taken that the house might not be disturbed by the members moving Postponed. from one part to another to conferone the vote to be given. That for the better observance of order, New Hampshire shall sit on the left hand of the President and on every question be first called, and each state from thence to Georgia shall take their seats in the order that their states are situated to each other. The delegates of the respective states to sit in their order of seniority. This relegated the President to the duties of a passive chair (no agenda powers) as one of 18 Delegates (Nine States, two delegate minimum), at best, in deciding important matters of State. 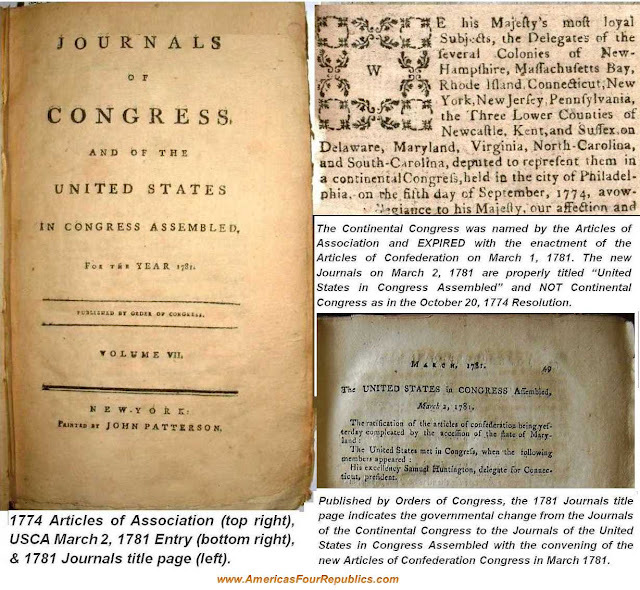 This new USCA Presidency was very weak in comparison to the Continental Congress Presidents who controlled the agenda, the mail (they read it first and decided what was to be brought before Congress) and were empowered to convene Congress with only one delegate present from only seven States. A Continental Congress President, after deciding what matters came before his congress, was empowered to vote on crucial legislation during the Revolutionary War as one Delegate representing his state with only six other states present (minimum quorum number was seven states with one delegate each). The USCA Presidents wielded no such powers, after the enactment of the rules, under the ratified Articles of Confederation and although Huntington had a three month reprieve on the rules, his successors would be bound to passively preside. 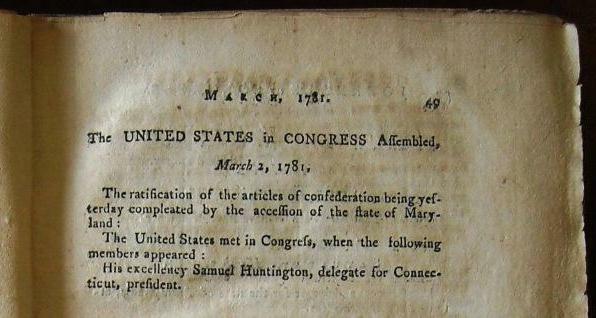 In addition to the mountains of primary sources recording Samuel Huntington's service as the first Articles of Confederation President, the USCA Journals report that there were two presidential elections occurring before John Hanson's Presidency and just after Huntington's resignation. John Hanson was not present. The first presidential election under the Articles of Confederation occurred on July 9th, 1781, and North Carolina Delegate Samuel Johnston was chosen the successor to the ailing Samuel Huntington. The following day, however, Johnston refused the office. The honble. Samuel Johnston was elected. The members, Mr. Mathews, Mr. Carroll, Mr. Sullivan. Delegate Thomas McKean accepted the USCA Presidential office and began to preside over Congress on July 10th, 1781, four months before John Hanson was elected to the USCA Presidency. USCA Journals 1781 printing open to the July 9 & 10th, 1781 entries recording the elections of Samuel Johnston and Thomas McKean as Presidents of the United States in Congress Assembled four months before John Hanson's Presidency. - Image courtesy of the Historic.us Collection. President Thomas McKean, like Samuel Huntington, executed numerous resolutions, proclamations, and letters as the second USCA President to serve under the Articles of Confederation. 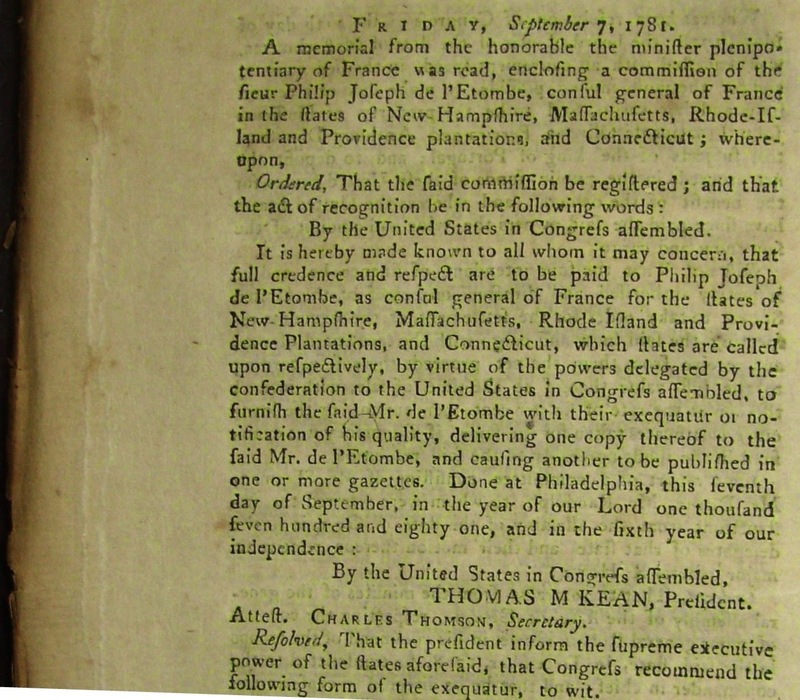 Below is the image of the September 7th, 1781, Journals entry recording a Thomas McKean resolution signature as USCA President. General Washington has been on a Visit to Count de Grasse, on board his Ship the Ville de paris at Cape Henry. He returned to Williamsburg the 23d Ult. He says he found the French Admiral disposed in the best manner, to give us all the assistance in his power, and perfectly to Cooperate wth. him in our present Attempt on Lord Cornwallis, and hopes to be before the Enemies Works in a few days. Our Vessels from the Head of Elk, are all Arrived, and were debarkg the Troops and stores, except a few, which were hourly Expected, their not having Arrived, is Accounted for from the Dullness of their Sailing. Every account from N York Confirms that of the Enemies having Suffered greatly in their late Engagement with Count de Grasse. That Admirals Account of it is very Short, and Modest. He Acquaints the Minister, that the British fleet having Appeared off the Capes, He immediately went out to meet them, Attacked their Van (which was treated very roughly) drove them off and then returned into Chesapeake; that he took two frigates in the Bay, which had been Sent in to Cut the Boyes from His Cables. The Defeat of the British fleet is a most Glorious and fortunate Event, as it will Effectually prevent Any Succors being Sent to Cornwallis, whose fate from present Appearances I think is inevitable God grant the Business may be Speedily Effected, that we may have time in Conjunction with the French fleet to Act Elsewhere before the winter season Comes on. On the return of the British fleet to N York, the Troops that were embarked for the Southward landed on Staten Island on Account of Sickness, where they Still are. My Stay here is uncertain, it depends upon the next Election of Delegates to Congress, and in these Cases you Know, no great reliance is to be put in popular assemblies, but be assured while I Continue, I Shall take great pleasure in Communicating whatever I think may Merit your Attention.